For more than 30 years, The University of New Mexico’s Africana Studies Program has celebrated the start of Black History Month with a kick-off brunch and featured speaker. This year, Africana Studies in partnership with the African American Student Services Program welcomed Dr. Freeman Hrabowski, III, president, University of Maryland, Baltimore County (UMBC). Nearly 500 people attended the 31st Annual Black History Month Kick-Off Brunch recently to hear Hrabowski’s speech, Paying It Forward: Blazing a New Path for African American Academic Excellence in the 21st Century. “I’ve tried to help people understand that they are preparing to be leaders, not simply to make money or have a job, but to change lives,” said Hrabowski in an interview before his visit to UNM. Growing up in Birmingham, Ala. in the 1950s and 1960s, Hrabowski got a firsthand look at the Civil Rights Movement happening around him, even participating in the Children’s Crusade of 1963. Now, decades later as a University president and renowned educator, he said it was those experiences that led him to develop programs aimed at boosting educational success in science, technology, engineering and math (STEM) for African American students and others. In 2012, President Barak Obama named Hrabowski chair of the newly created President’s Advisory Commission on Educational Excellence for African Americans. That same year, he was named one of Time magazine’s “100 Most Influential People in the World.” Hrabowski, a mathematician by trade, has been honored by the American Academy of Arts & Science and has received the prestigious McGraw Prize in Education. He was also recently featured on CBS’s 60 Minutes, for his university’s continued achievements in innovation and excellence. 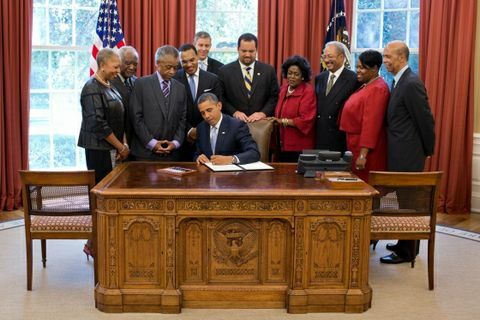 Freeman Hrabowski (fourth from the left) pictured with President Barak Obama during the signing of the White House Initiative on Educational Excellence for African Americans Executive Order. He said while the statistics are shocking, he does believe change is possible. Along with an emphasis in self-belief, the longtime educator said society must do a better job improving reading skills among elementary aged children. Hrabowski said, many times, people think the key to success in STEM is the specific science, technology, engineering or math, when in fact it’s reading and comprehension skills that truly help students succeed in the STEM fields. For minority groups, Hrabowski said exposure to future possibilities is also extremely important. He said many African American children, for example, have never seen an engineer or a researcher that looks like them, something he thinks needs to change. Hrabowski met with UNM administrators as well as University and Albuquerque Public School students during his visit. He also took time for a book signing of his new book, Holding Fast to Dreams: Empowering Youth from the Civil Rights Crusade to STEM Achievement. For more information on a variety of other events celebrating Black History Month, click here.